Beret Olsen is a writer, teacher, and photo editor for 100 Word Story. She loves toast, the Oxford comma, and all your comments and questions. A few weeks ago, I was on a plane watching an endless parade of Buzzfeed clips. My hour of debauchery was made possible by Virgin Airlines, who gave my kids an entertainment IV, and gave me an adult beverage and my own remote. That doesn’t happen often at home. In between raw eggs dancing on a speaker and men trying to walk in high heels, I learned about glow in the dark bubbles. As some of you may have noticed, I like things that glow. Last fall’s obsession was glow-in-the-dark pumpkin bowling. Very festive. I’ve always had a soft spot for what I call “misfit lit.” Into this category I throw a few of the best books for young people I’ve read in the recent past: Loser, by Jerry Spinneli; Wonder, by R.J. Palacio; and A Mango-Shaped Space, by Wendy Mass. A major appeal of these books is that everyone feels like an alien at some point in their lives–often and particularly in middle school. Delving into the brain of an outsider and seeing how they experience and cope with difference can be both comforting and empowering. It could also encourage young people to look for what they might have in common with others, no matter how different they appear to be. On July 4th, it was ridiculously cold and foggy where I live. Too cold and foggy to see fireworks, or even to muster enthusiasm to watch the fog change colors. Instead, we went home and made hot chocolate. July 5th dawned sunny and warm, and I found myself pouring the extra hot cocoa into a popsicle mold that had been sitting in the dish rack. Honestly, I just didn’t want to deal with the leftovers, because who wants hot cocoa on a warm day? 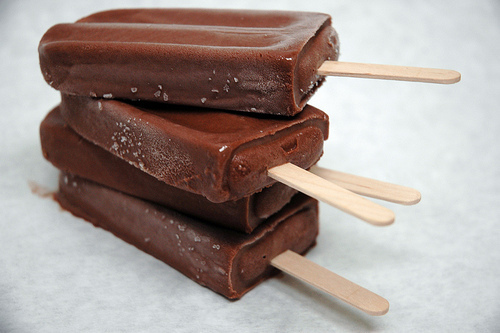 A few hours in the freezer and voilà: I had accidentally made fudgsicles! Simple and tasty. In fact, waaaaay better than store-bought ones. 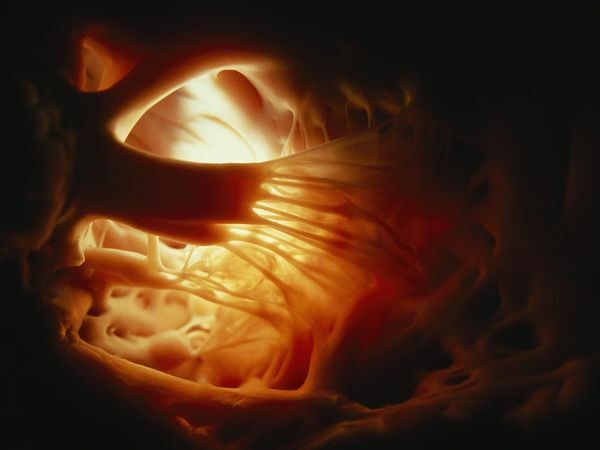 From National Geographic.com, where they have lots of incredible photographs of hearts. These were desperate times. After a prolonged absence on LobeStir, I wanted to come back with a giant, fabulous valentine full of amazing projects and ideas for you, dear reader. Only I didn’t have any. Or time. And in my harried search for anything interesting and loosely tied to Valentine’s Day, I discovered that my spouse may be right–this is a distinctly lesser holiday developed primarily to sell greeting cards and candy. 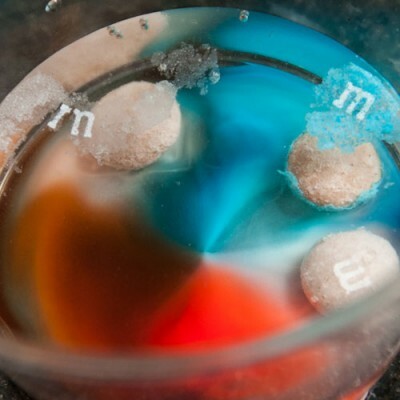 I did find out how to float the letters off of m&ms and Skittles, however. Nothing Spreads Holiday Blessings like Two-Day Shipping. Miss Nine stole this idea from Anne Le of YouTube. Link to her video plus directions for other projects I mention will follow my brief diatribe. True gifts come from the heart and the hand, not the store. What a blessing that my kids have internalized such an important message. Now. Could we just buy their teachers some gift cards and be done with it? No, ma’am. 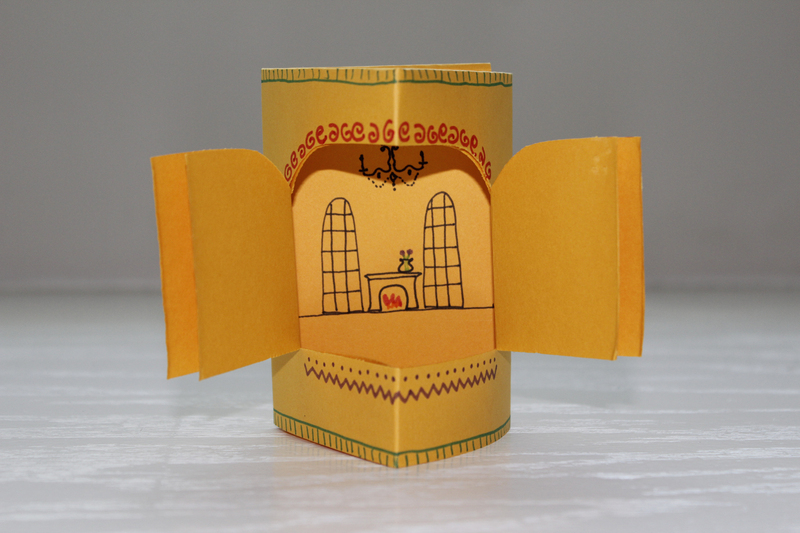 My kids have watched unlimited DIY videos in order to prepare a Christmas cornucopia for all of their loved ones: fudge, lavender sachets, hot cocoa candles, soap, butter mints, rejuvenating foot scrub, and pop-up greeting cards made out of last year’s holiday card crop. I wish I were exaggerating. Our house looks like Santa’s workshop crossed with a tsunami. “This is fun, right?” the spouse asked me last night as he stirred condensed milk into melted chocolate with one hand, and lined pans in foil with the other. I was melting crayons with Crisco and trying mold to soy wax into faux marshmallows. Sure. Fun in a boot camp sort of way. “Chop, chop, people!” I yelled. “Santa’s elves go off duty at 9 pm!” Not likely. The last time we got the lights out by nine was back in decorative gourd season. Work? Email? Holiday cards? Maybe next year. Homework? Practicing? Who has time for that when we are busy helping our children be thoughtful? Meanwhile, our ornaments are still in boxes at the foot of the tree. We’ll be lucky to have 36 hours with the decorations up. There have been so many store runs and late nights for the kids’ handmade extravaganza that I have had neither the time nor the energy left to figure out my own gifting plan. They are all super easy. 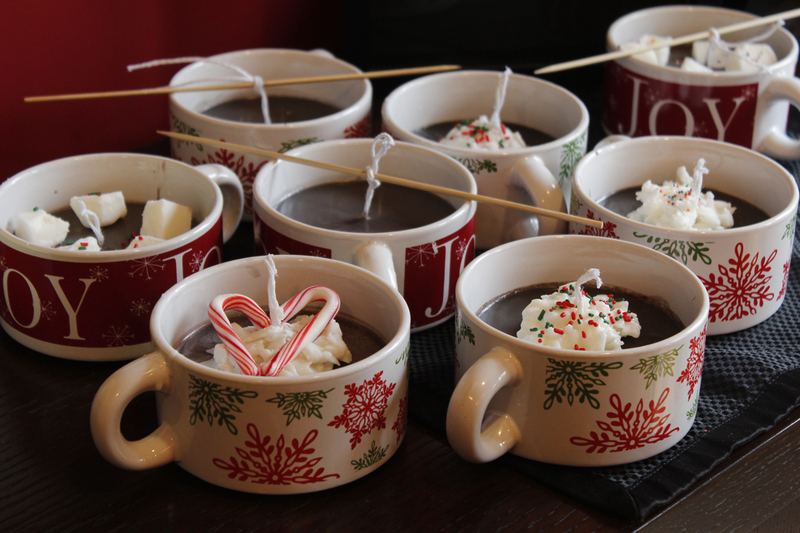 Click here for Anne Le’s YouTube tutorial on hot cocoa candles. Only notes to add: mugs were $1 each at Michael’s. We used Crisco for the cocoa part—one giant tub of it made six candles. Only used half of a one-pound box of soy wax for the whipped cream and marshmallows on top. Also, we used skewers to keep our floppy wicks standing while we poured in melted Crisco. 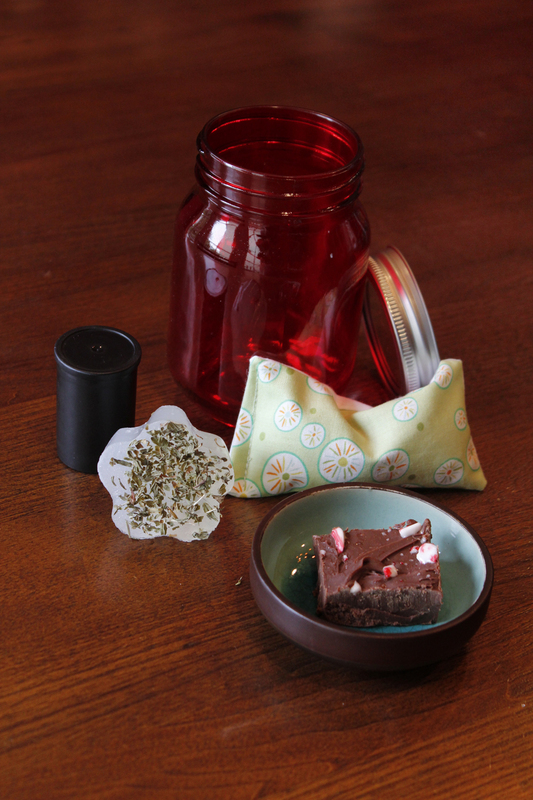 Miss Eleven wanted to make her friends what she called “Spa in a Jar:” foot scrub, soap, lavender eye bag, and fudge. She made butter mints, too, but those are much more complicated. Foot scrub: two parts Epsom salts to one part olive oil. We put the concoction into empty film canisters. Add a few drops of essential oil if you like. Lavender and peppermint are both nice. Maybe not together, though. Miss Eleven’s hot tip for extra soft feet: use the foot scrub at night, before bed. Then put on warm socks and go to sleep. Soap: melt glycerin or cocoa butter (you can find at craft stores) in a microwave-safe container. Add a few drops of Eucalyptus oil, or some other oil, if you like. 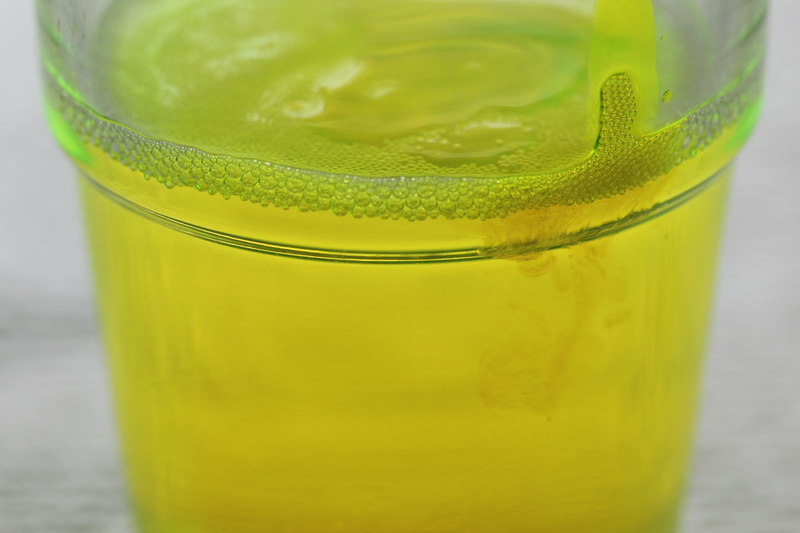 Grease a plastic container with petroleum jelly and pour in the melted concoction. Allow to set about 20-30 minutes. Pop out and enjoy! Miss Eleven sprinkled dried spearmint on top before the glycerin set. Hers was shaped like a flower because we had a mold. You could also use silicon baking cups or ice trays to make different shapes. Don’t forget the petroleum jelly so that you can remove the soap easily. Lavender sachets/eye bags: Proceed as if you were making a pillow for a guinea pig. Cut out two small rectangles of cotton fabric (ours were about 3 inches by 6 inches) and sew right sides together on three sides. Turn right side out. Fill mostly with raw rice and add a tablespoon or two of dried lavender. Sew the top shut. For extra warm and fragrant relaxation, pop the bag in the microwave for a few seconds before using. Obviously, test the temperature of the bag before melting your eyeballs. Fudge for Dummies: You can work really hard on fudge–wielding a candy thermometer and corn syrup and whatnot–or you can melt 18 ounces of semi-sweet chocolate with a can of condensed milk and a teaspoon or two of vanilla. Spread the mixture into a foil-lined 8-inch square pan. Not kidding. Prefer your fudge to be less dense? Add a cup of mini marshmallows while you are melting the chocolate. Add nuts, if you like. Need some fancy sprinkles? Take a hammer to candy canes to sprinkle on top. Speaking of which…have a holiday party you forgot about? Dump a cake mix in the oven. Cool. Top with delicious ganache (melt chocolate chips in the microwave and gradually add room temperature cream until it’s spreading or drizzling consistency. Hammer candy canes and sprinkle on top. Or skip the ganache altogether by sprinkling powdered sugar through a sieve onto the top of the cake and then plopping raspberries here and there. Or bring wine. That’s always festive–except at school functions, when it is frowned upon. You probably knew that. 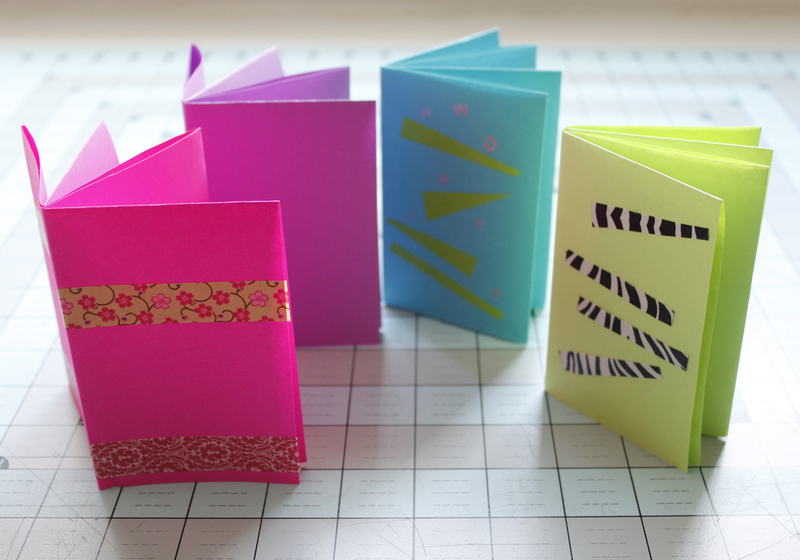 Need a last minute card? Special bonus! 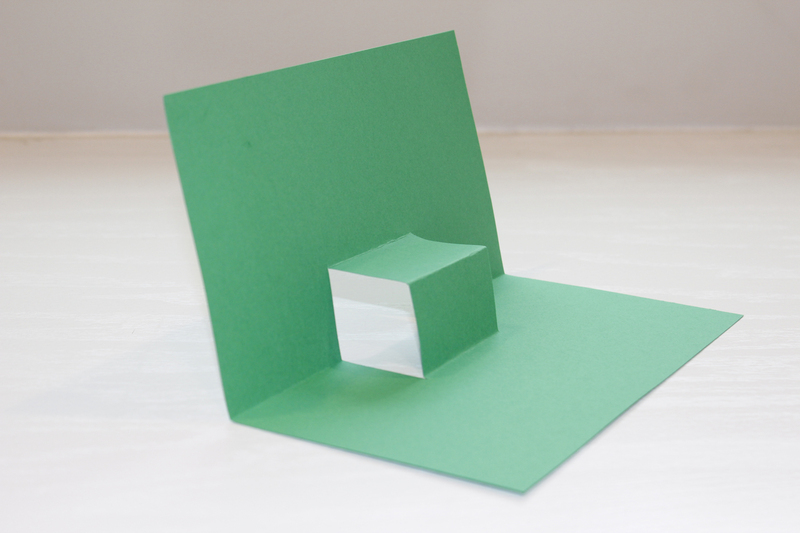 Pop-up cards: Fold a piece of paper in half. 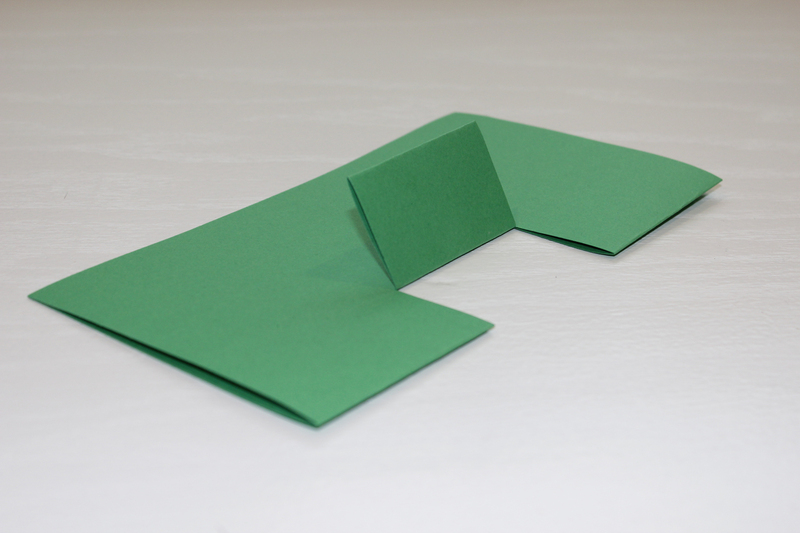 Cut two slits into the fold, equidistant from the edges. 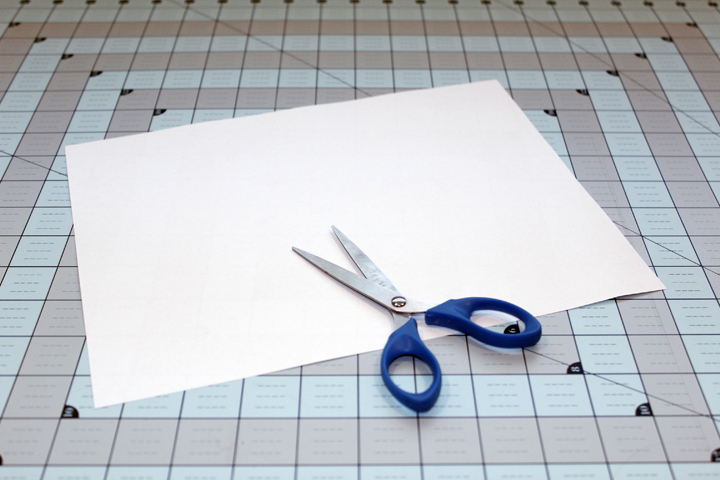 The cuts are ON THE FOLD. Accidental special bonus on view here: I write reminders on my hand. 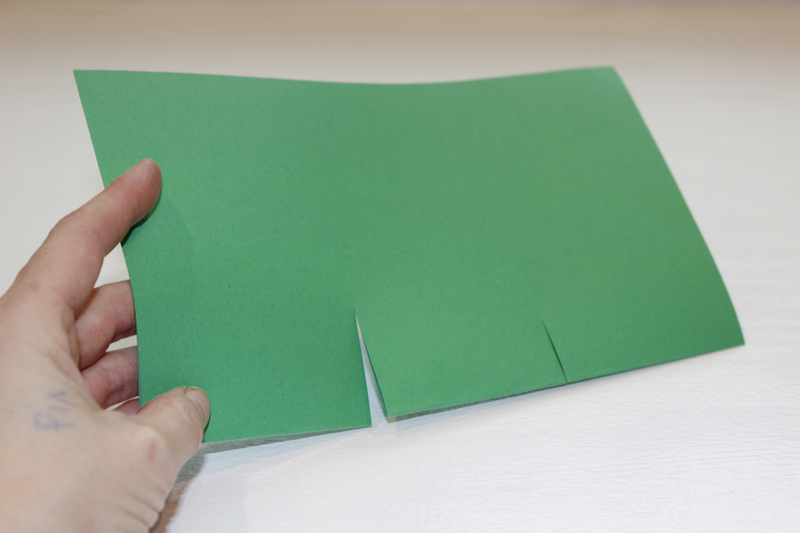 Fold that new flap up and crease. 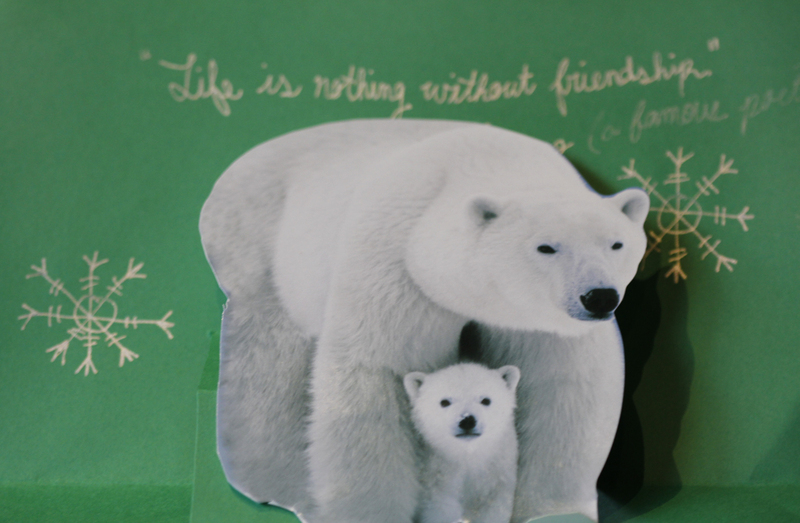 Cut up last year’s holiday cards. Glue something festive on the popped out piece. Author Beret OlsenPosted on December 20, 2014 October 11, 2017 Categories Art, Baking, fun, Gift Ideas, HolidayTags Candles, DIY, Fudge, Holiday giftsLeave a comment on Nothing Spreads Holiday Blessings like Two-Day Shipping.